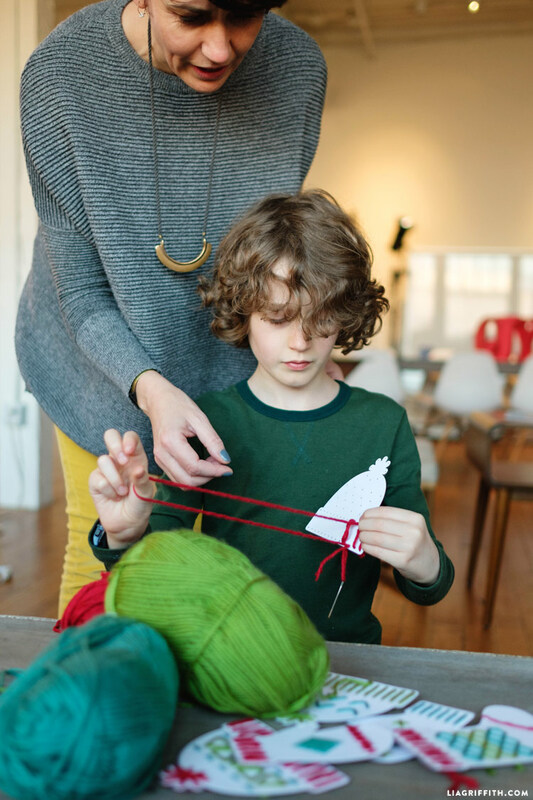 We’ve been having a great time in the studio brainstorming holiday kid’s crafts this year. Last Mother’s Day our illustrator Krista created these pretty yarn cards for kids to celebrate Mom, and now that Christmastime is here, we thought we would bring back the easy technique for some holiday fun! 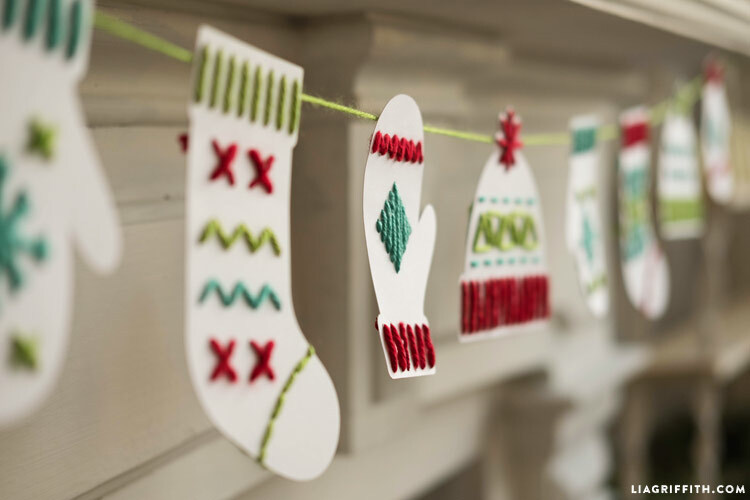 Our Christmas yarn art set includes 6 winter designs with gloves, hats and stockings. 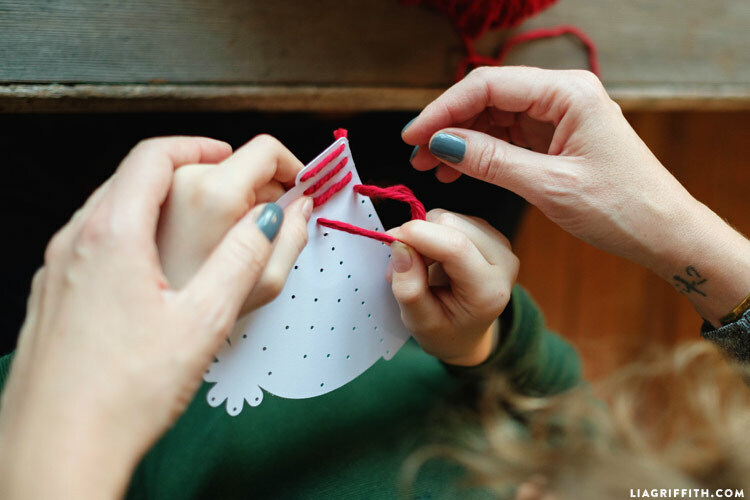 This safe project is fun to craft with the kids, or a great way to occupy them while you are doing your holiday decorating and cooking. There are PDF versions if you are cutting by hand, or SVG files if you have a cutting machine. 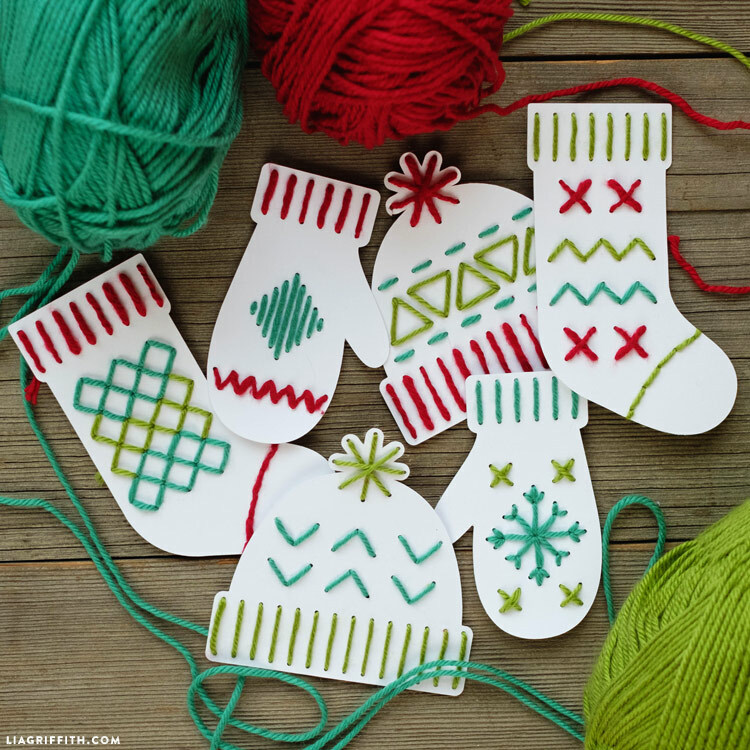 Start by gathering your Christmas yarn art materials. You can use any yarn, but we recommend using acrylic for these. There’s no need to dish out for the expensive stuff here! Save that for your knitting projects 😉 Download the files below and print or cut onto 8.5 x 11 white cardstock. The SVG file will allow you to pre-cut the holes with your cutting machine. 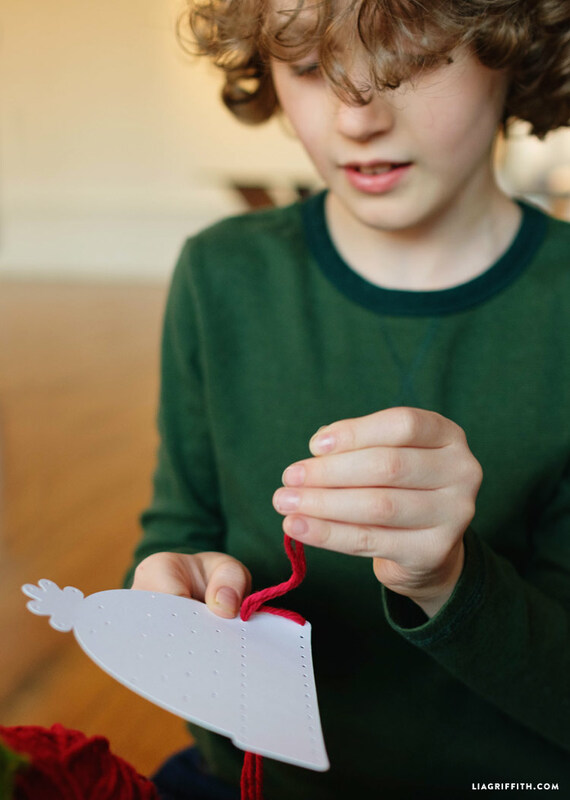 If you are cutting by hand, you can use a small hole punch or craft knife to make the holes. Use a large embroidery needle (these will have larger eyes for the yarn) to start threading your yarn through the holes. For your initial stitch, stick your needle through the cardstock from the back so that you can eventually tie the yarn off when you finish. Great idea! looking made to easy,thanks for sharing this i’ll try it on this Christmas. PDF pattern isn’t loading. Please assist. Hi there, the download is working fine on my end. You might try restarting your web browser? If you still have trouble, please send an email to hello@liagriffith.com. 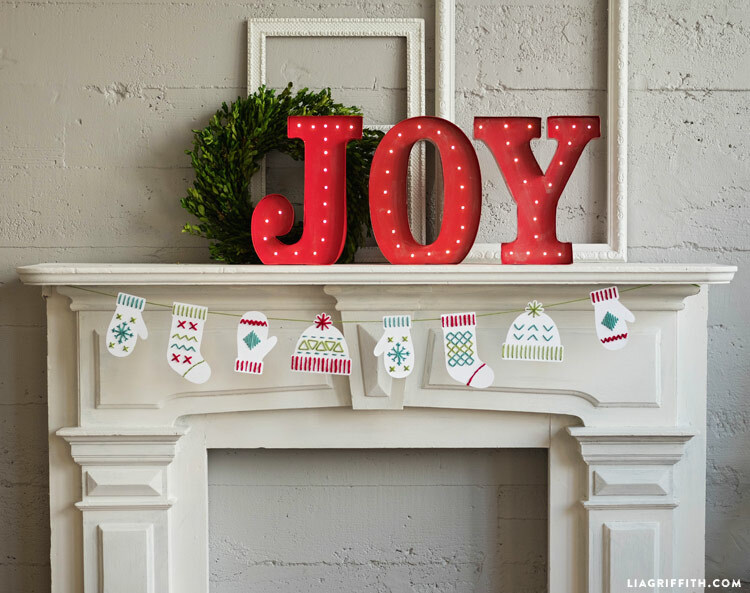 The garland of these yarn and paper gloves, hats and stockings looks really gorgeous and very festive! We are certainly going to try this project tomorrow with my 4-year old daughter. Thank you! I love all your paper crafts and this one, the Christmas Yarn Art is too adorable. I can’t wait to share this with my grandchildren!